, waiting to tell you about the next chapter. My local Family video has this game for $30. I'm thinking of buying it outright instead of gamepass. Might as well. New content update coming on Tuesday..
Well I ended up getting Gamepass. But I may still buy SoT from that store at that price very soon. This week's update introduces The Hungering Deep, the first step in our post-release content plan. A new and not inconsiderable threat to seafarers is joined by a raft of other additions, including a voyage of discovery upon which you'll cross paths with Merrick himself. 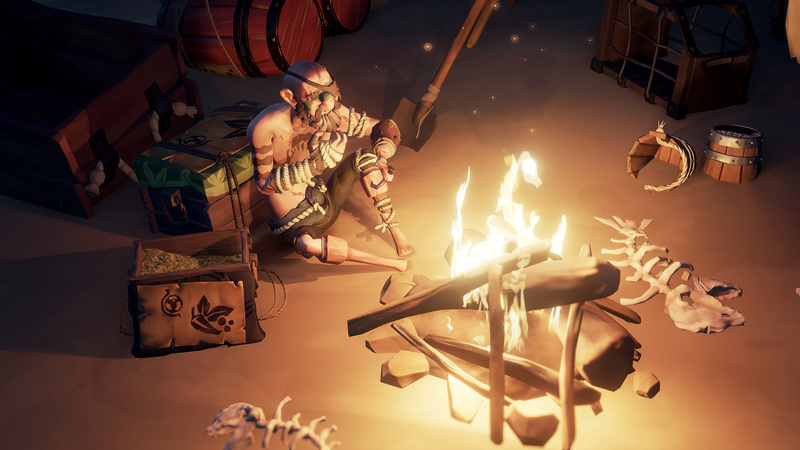 This content update introduces and showcases a raft of new features that will persist in Sea of Thieves beyond Merrick's story and its time-limited campaign. Speaking Trumpet - Parley! Let other ships know if you are friend or foe with the new Speaking Trumpet, making yourself heard from longer distances. The first Speaking Trumpet is obtainable through The Hungering Deepcampaign, but purchasable variants will be arriving in the shops in the near future. Ship's Flags - Want to sink and plunder, or seek allies to adventure with? Let your intentions be known with new flags which can be raised high above your ship! Climb up to the crow's nest and decide which to raise. Scars - What enemies have fallen to your pirate might? Scars earned through campaigns and events such as The Hungering Deep will allow you to tell a story of your pirate's history and adventures. These are not purchasable, they must be earned. Sailor Sail Tints - Want a splash of colour on your ship but don't have the coin? Those Shipwrights are impossible to bargain with. Sailor colour variants for you more cost-conscious pirates are now being stocked. These include Black, Grass Green, Royal Blue, Red and Yellow. Majestic Sovereign Clothing - If it's time to freshen up your look, check out the new Majestic Sovereign set in the clothing shop, it may tickle your fancy! Remember stock is different from outpost to outpost, so you may want to check the Ancient Isles. Pirate Legend Flag - Are you even a legend if you don't have a flag to say so? Some say not. Rush to the Shipwright in the Pirate Legends Hideout to get yours! Upon spawning at an outpost, an issue has been resolved which would occasionally cause the crew's Galleon to be missing. Athena's Fortune Bounty Quest skeletons are sometimes unable to be found. We are working to resolve issues on the reported islands: Plunder Valley and Thieves' Haven. If you encounter this issue, please submit a bug report to our Player Support Team with as much detail as possible on your location. I beat the mag today with a crew of random. Best thing about it is how it smashes into the ships and even rocks the big galleons. I heard of 3 to 4 galleons meeting up to fight this thing. For me it was 2 galleons and me on my sloop. The b**** went after my sloop the most and it went down so I swam to a galleon. The mag passed by me really close when I was in the water too. Haven’t played SOT since the first week. Waiting for the game to load up on content. How’s this first wave felt? Significant impact or just slightly moved the needle? It's a cool experience but nothing mind blowing. If you don't do the meg quest in the first two weeks though you don't be able to get the shark figurehead with glowing eyes you get for finishing it. Finished the hungering deep on Friday. The whole thing isn't all that long, but wish this would have been more the setup for how you do quests. You had to go around and collect these journals and then figure out where to go from the clues in there. It took you to unmarked islands and even into an under water cave. The coop aspect of needing 5 people was pretty cool, although I wouldn't want it in all quest obviously. You just got a better feel for the world, got to do a bit of exploring that took you to different places, got a boss fight, and got to learn a bit of lore along the way. If they had a main quest line that was full of quests like this, I would have helped the game out a lot. Granted the end game still needs to be changed and tweaked, but it would have helped. When I first heard about Sea of Thieves, this was a little more along the lines of what I was expecting. Amazon has the physical disc for $38.30 US. Worth it? The game looks interesting (and I'm not overflowing with hype which helps) but I tend to prefer solo and that seems like a bad way to play. It's not the best game to play solo but it can be done. Also thinking about picking it up for that price. Knew i wouldn't have to wait long to get a deal on it and i prefer owning the bigger exclusive and multiplat releases physical. I'd almost rather have digital and play anywhere though. Is there a matchmaking or some easy way to play with randoms online? Color me one of those weirdos who never plays SOT, doesn't plan to in the near future but who's very interested in what they show at E3. There's so many damned things they can do with this sandbox. Literally could be a mini-Fortnight situation where you have a very niche and average game that blows up with the right game mode. Hoping Microsoft stays persistent with this one. Core is there and because the cupboard is so bare, there's almost no limits in what they can change or add. I wish there had been a campaign for offline too. Yes, you can chose to start alone or with a crew. When you load in you are in a shared world with other players. So if you start alone and meet someone you can also crew up with them. Just get the Game Pass. It's not much more expensive for the year, and you get a bunch of other ones too, like Crackdown 3 when it comes!es out. I think I'm the only Xbox fan who doesn't do game pass. I guess I just should. I know I'll buy it but not have time for any of the games anyway. I am not bothering with it because I just like owning the games. More power to you. For me, going all digital and using Game Pass has not only allowed me to play more games this Gen, but there are no discs for my kids to ruin. It's awesome. We need to hook up again. You're not the only one, me too. I own all the games that I would ever want game pass for already anyway. Bilge Rat Progression Screen - Bilge Rats now have their own dedicated progression screen! This information can be found on the front page of the progression screen via the [Menu] (controller) or [Tab] (keyboard) buttons. Chart your progress through the Skeleton Thrones event on this screen, not to mention getting some important clues as to the location of these elusive thrones. Colour Blind Accessibility - Filters can now be applied from within settings to assist with red-green and blue-yellow colour blind pirates. Merrick's Shanty - Merrick's shanty has been added to the list of playable shanties. Sailor Drum - The Sailor Drum has been given to all players. Find it in the second page of your item radial. Sailor Speaking Trumpet - The Sailor Speaking Trumpet has been given to all players. Find it in the second page of your item radial.